In nearly 1,000 miles traveled over the course of 3 days in the 520,000 mile Legend, the only thing that I could even consider a “mishap” was when I hit a large tumbleweed dead-on, southbound on Hwy 93 near Wikieup, Arizona. No damage was noted, just a few stray twigs lodged in the grille that I picked out on my next pit stop. The joy of traveling through the desert! 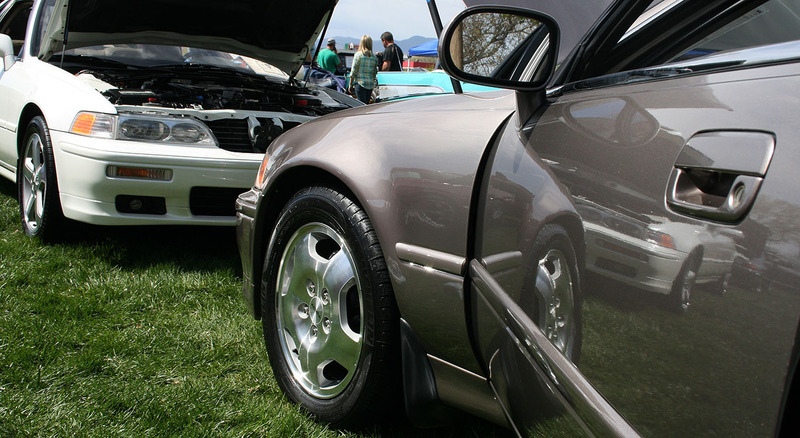 One of the annual traditions that I most look forward to is that of traveling to my hometown each Easter to participate in a car show. This is a picture from the show in 2004. 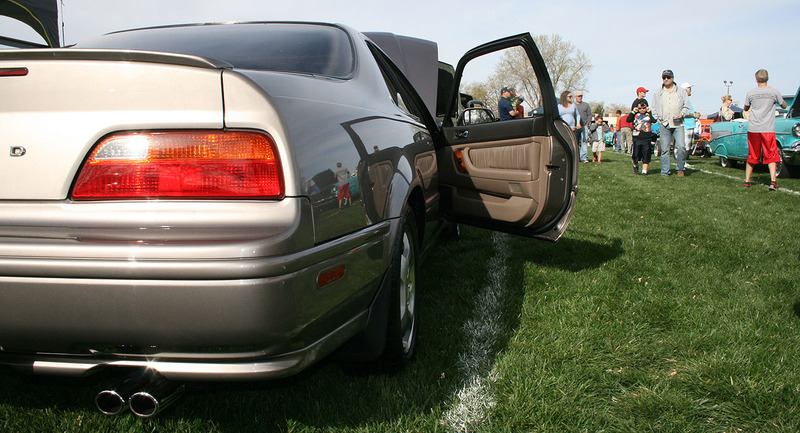 My friend Blair entered his 1992 Legend LS coupe automatic with Frost White exterior and black interior. 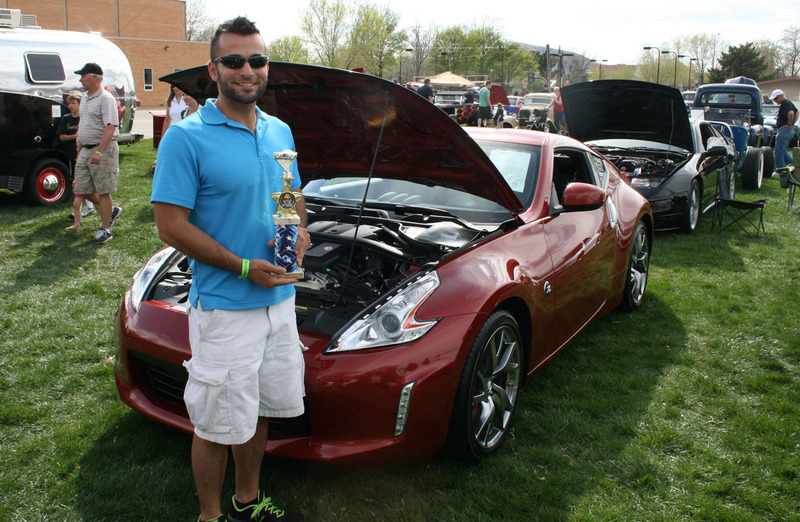 He and I both ended up taking home trophies in the “Imports” class that day. 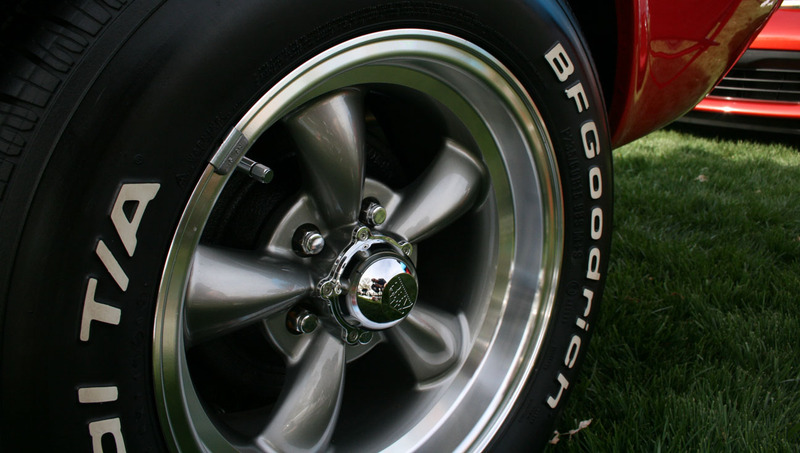 Blair’s car had all kinds of upgrades, including a set of 18″ Giovanna wheels. Nine years later, I entered the Legend in that same show this past weekend. Here’s the play by play of the weekend. Heading out on Friday – my friend Matt took his 2013 370Z, and I took the 1994 Legend. Along the way, our first pit stop was in Boulder City, Nevada (home of Hoover Dam!) to meet up with my friend Jessie. 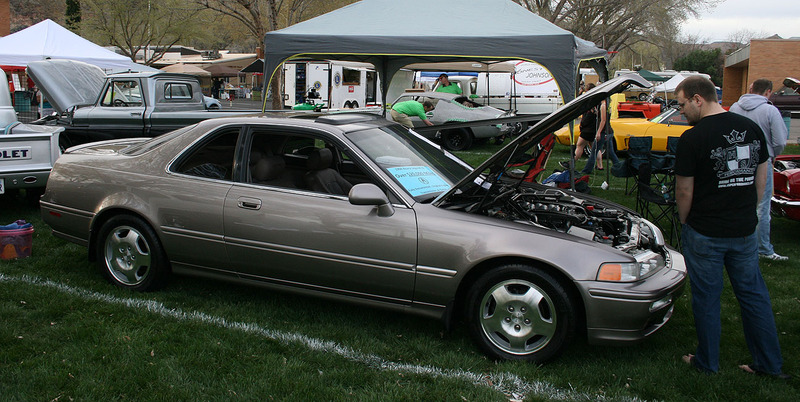 Jessie has a Rosewood Brown 1992 Legend L sedan automatic with 140,000 miles on it. He has taken great pride in restoring it mechanically and it runs great. Next on his list are some paint and body work. Legend lovers. Jessie’s Legend is older than he is! If only I’d been so lucky to have such a ride at his age. The OEM spoiler, tinted windows, and chrome wheels round out the package. Jessie says he’s on the lookout for some of the factory 16″ Legend GS wheels like my coupe has. After having lunch, Jessie followed me on Hwy 93 toward Las Vegas and snapped this pic at a traffic light. 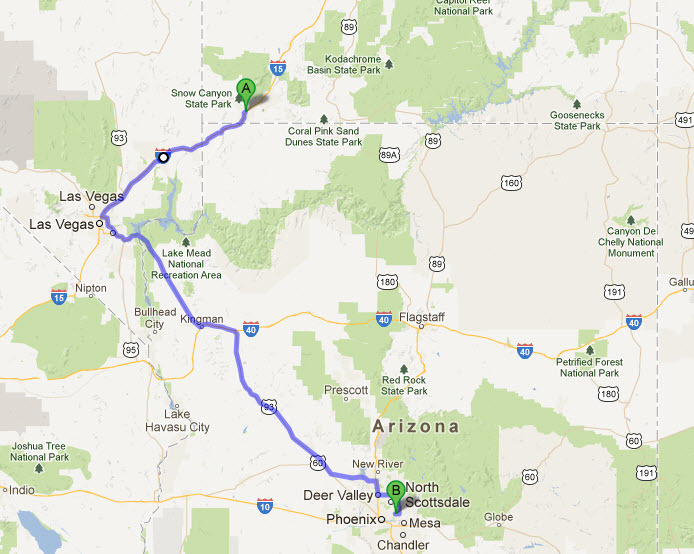 Matt and I leap-frogged each other a number of times throughout our 6 1/2 hour journey to southwest Utah. Here I let him take the lead in his Magma Red 370Z on Interstate 15 north of Las Vegas, Nevada. Cody was lucky to pick this up just a couple of weeks ago in Salt Lake City, Utah. It’s immaculate. Low mileage, meet high mileage. I peeked inside and this thing still smelled new. 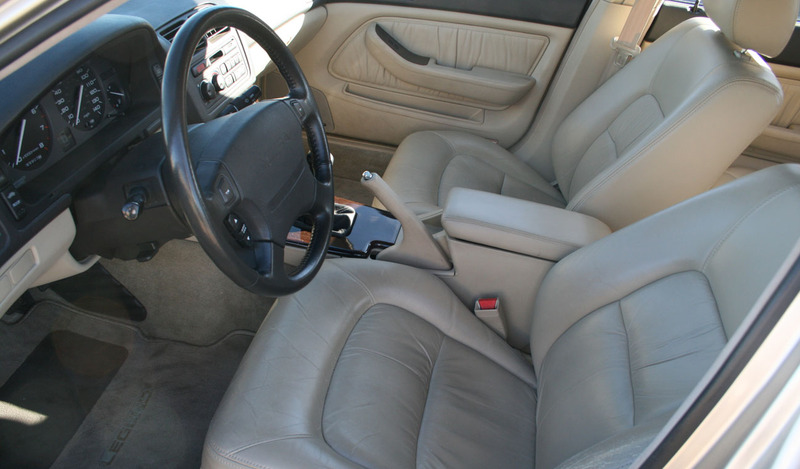 No cracks in the leather, no cracks on the dash — virtually zero detectable wear on this pristine example. Cody could sense my amazement (and probably my jealousy!). The only update Cody has planned for this car is window tint. 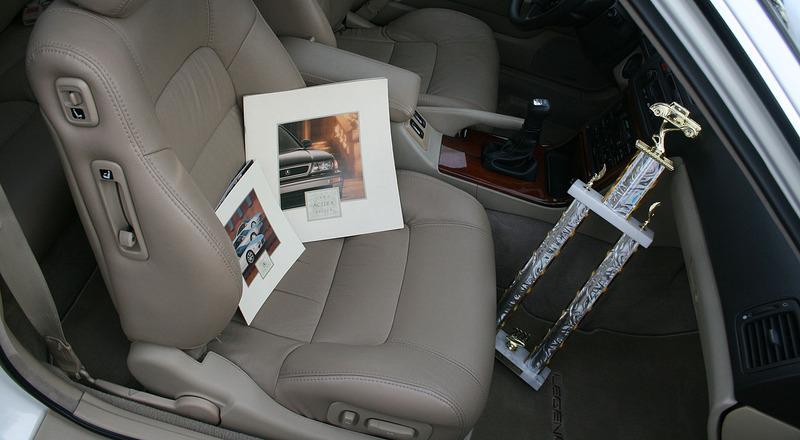 I agree with that decision – protect the interior and keep the car otherwise 100% stock. It’s a truly unique find in this kind of condition. Thanks, Cody, for meeting up! Next time I’m in St. George, let’s swap car keys so I can see how that thing drives. 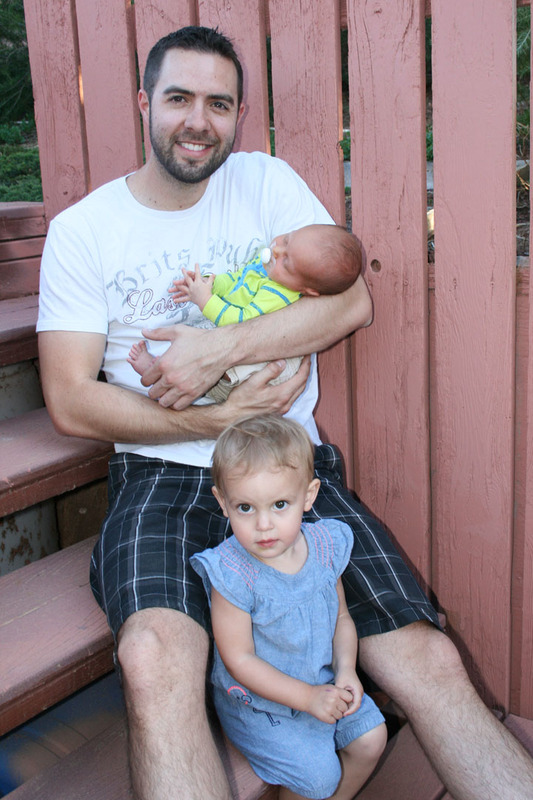 Reunited at last with my niece and nephew. These kids are my pride and joy! My friend Branson and his dad Don arrived in the evening. After some late-night car detailing, we all set out very early in the morning (6:45 Utah time; 5:45 Arizona time) on Saturday morning for the car show in Hurricane, Utah which was about 20 miles away. We got great parking spots on the grass lawn. 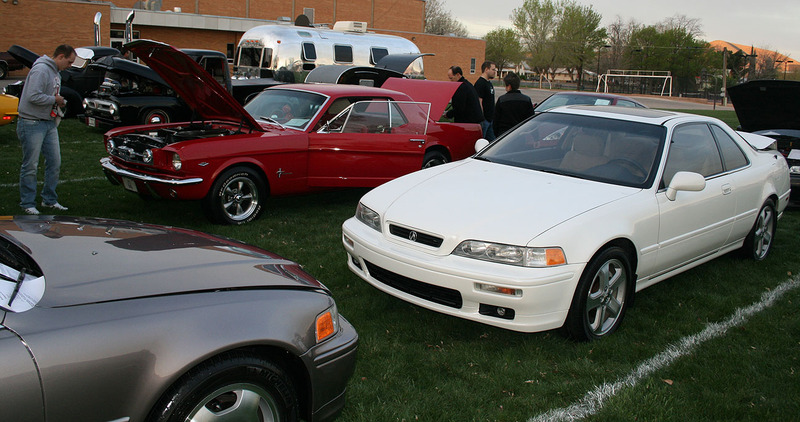 Pictured here are Don’s 1965 Ford Mustang 289 and Branson’s 1995 Acura Legend LS coupe. We positioned the Legends so that they’d face one another. 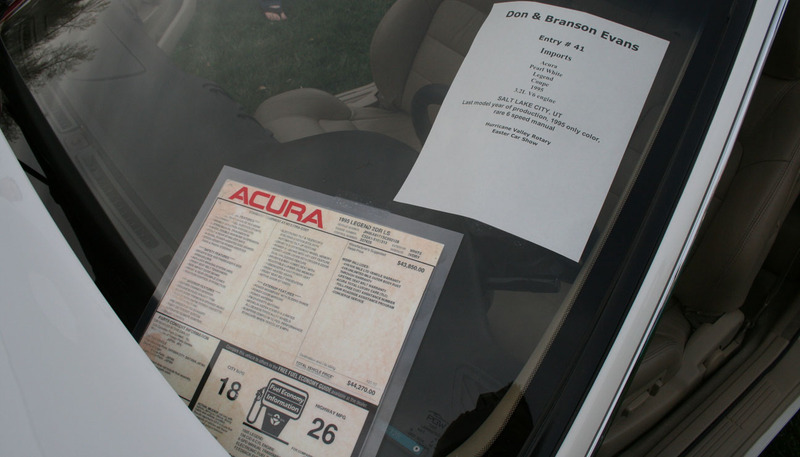 I had a couple of laminated signs on my windshield: One stating that the car had over 520,000 miles on the original drivetrain, and the other was a color copy of the window sticker showing its $41,885 price in 1994. Out came the detailing supplies for some last-minute touch ups. 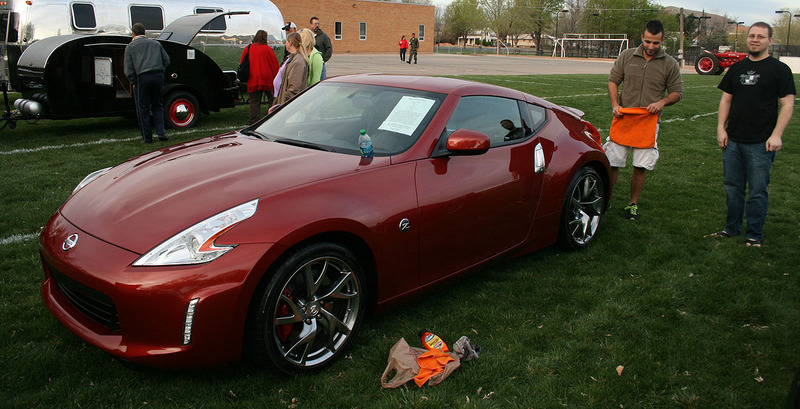 This shine was achieved with Meguiar’s Gold Class wax, applied by hand and buffed off with microfiber towels. I used Meguiar’s Endurance tire gel on the Michelins. 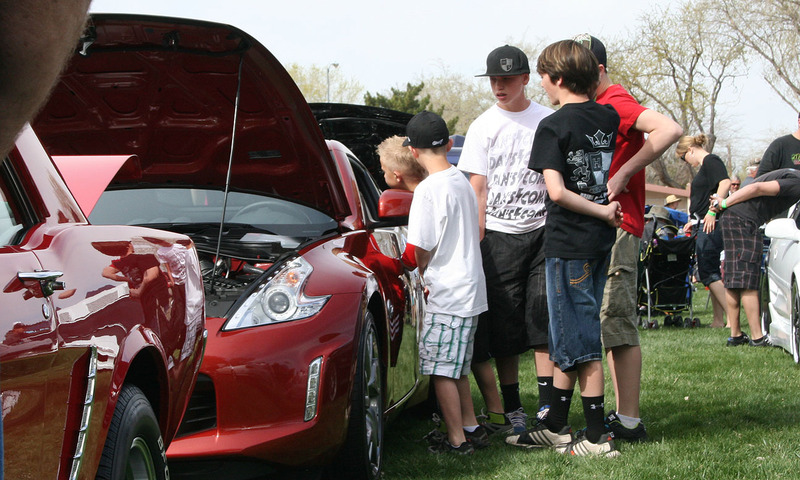 Matt’s 370Z turned over 2,000 miles on its odometer on the way to Utah. It got a little bit of detailing too. Those 19″ Rays wheels came as part of the Sport package. You can also see the new-for-2013 LED lights in the front fascia. While we waited for the show’s official 10 a.m. start time, we wandered down the street for a breakfast buffet. 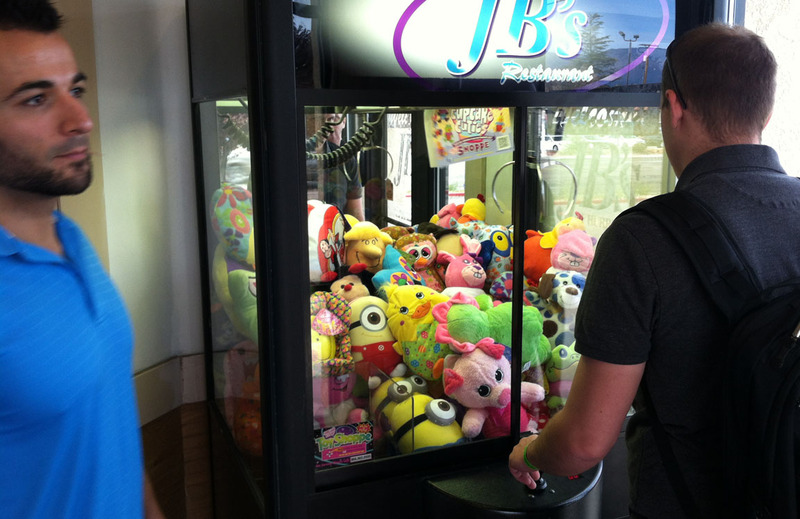 Branson couldn’t resist dumping $5 into this claw machine in search of a stuffed animal. He failed. Back to business. Here, I’m teaching Dan about the difference between a Type I and a Type II Legend engine. Dan, by the way, drives this right-hand-drive Nissan Skyline with a long list of modifications. 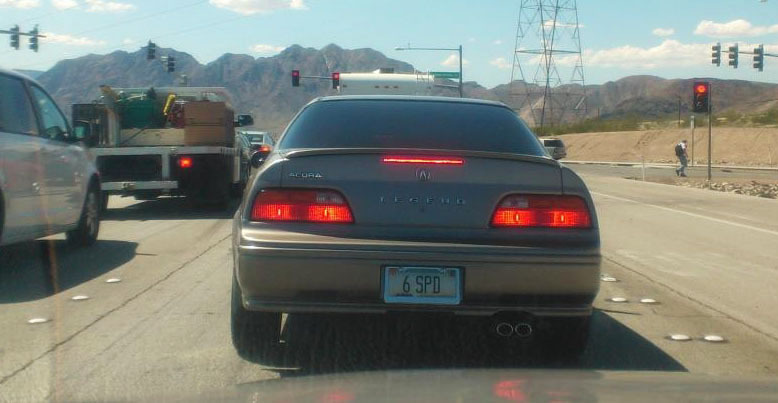 He was also registered in the Imports category and he parked near us. Video of some of the action. Branson displayed his window sticker as well. His car’s MSRP was $44,270! The car’s color is Cayman White Pearl, which was offered for only the last year of Legend production — 1995. Inside, Branson showed his factory literature including two brochures from 1995: a Legend-specific 12×12 brochure, and a smaller full-lineup brochure, both in mint condition. The trophy there is from a previous show that Branson won in. Don’s here trying to point out a speck of dirt on the front end of the car. Over the course of the day I was approached by at least a dozen people wanting to talk about the car. Usually the first question they’d ask is, “What kind of oil did you use to get it to last that long?” Many were surprised to learn that I’ve only used conventional 5W30 oil and never synthetic. I also had a print-out handy of all the car’s maintenance so that I could tell anyone if specific parts had ever been changed. Here’s another look at the 1965 Mustang that Don and Branson restored from the ground up. 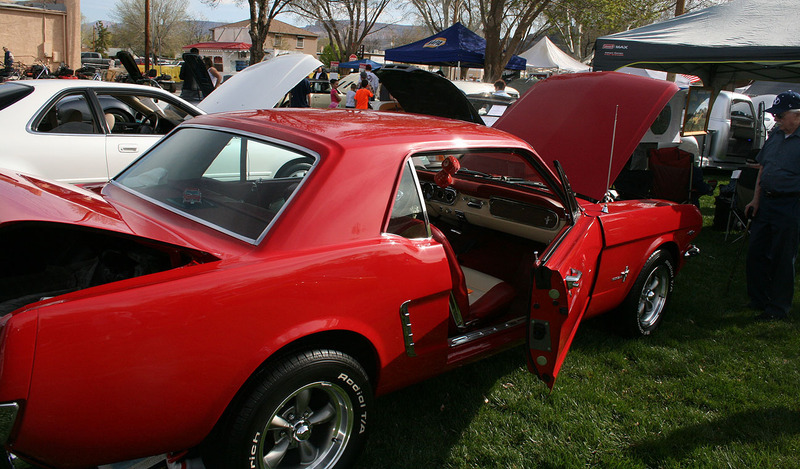 It’s equipped with a “Pony Package” interior that included a wood steering wheel. The car drew a lot of attention. Panorama of some of the other vehicles in the show. There was a lot of nice stuff. 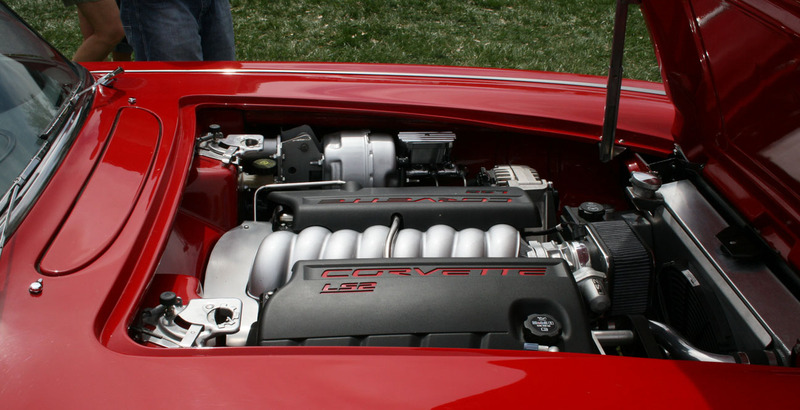 I was impressed by this build – our friend Keith put an LS2 Corvette motor into an older bodystyle car. 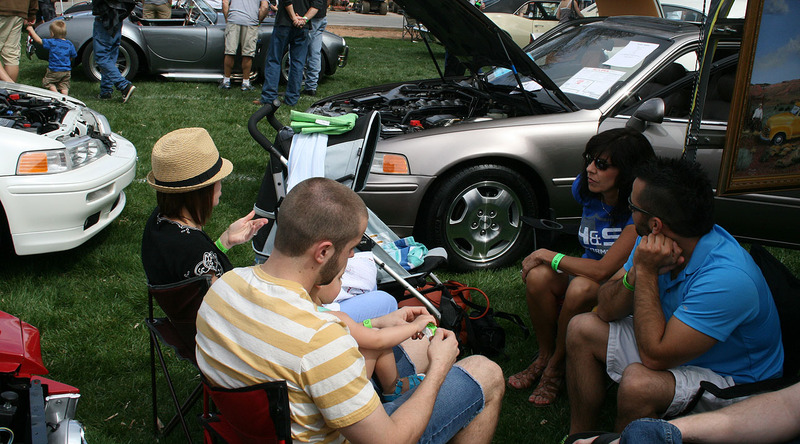 It was interesting to observe the different types of people who were drawn to the cars. The Z was always popular with the younger generation, the Mustang with the older generation, and the Legends were a little of both. Showing off some mirror shine here. 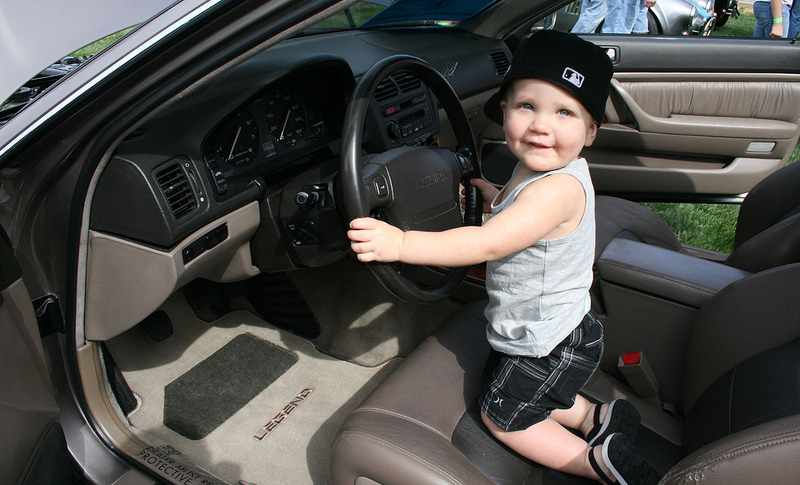 Branson’s car in the background has a set of 17″ wheels off a 2003 Acura TL Type-S.
Here’s an Acura driver in training. This is my nephew Beckam sitting inside the Legend. The set of floor mats seen in use here are actually for show-only use. I swapped them out with my “daily” mats before driving away. Another nephew: Rex. This little guy is only 3 weeks old. Such a cutie. Visit from some friends. Here are Buck and Kyle. 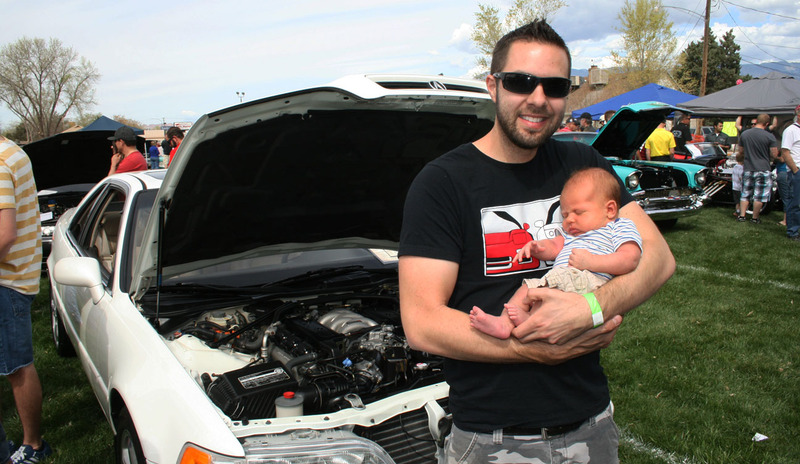 Buck is an Acura driver with a very clean 2002 RSX Type-S. Finally, here’s little Miss Vivienne. She’ll be 2 years old in a couple of weeks, and she’s the sweetest thing ever. At 4:00 p.m., the awards ceremony kicked off. Matt end up placing 2nd in the Imports category. Departure from the park. There you can see Matt leading the way in the Z, then Dan’s Skyline, then Branson. 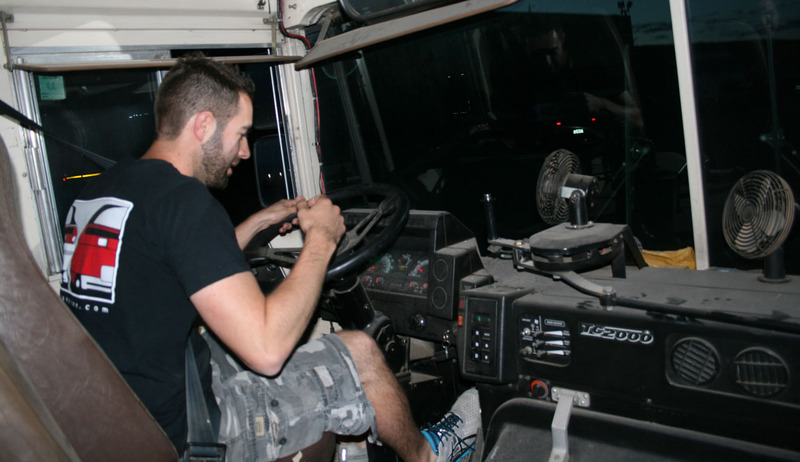 Later that night, I got a driving experience unlike any other I’ve ever had: I got to drive a school bus. 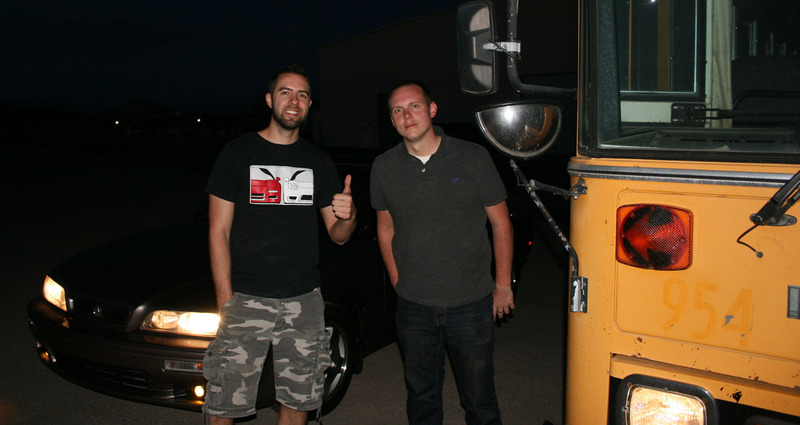 Last year, my brother picked up a retired bus because he needed to shuttle a bunch of people around at an event. Since then, the bus has mostly sat unused in his company’s back lot. Well, my friends and I decided it was time to give that bus a little exercise. Matt was the first to get behind the wheel. It took us some time to figure out how to operate the controls. There is a push-button automatic transmission, and the switches for the overhead lights are on the panel to the left of the driver’s seat. This is a 1996 Bluebird school bus. It’s got capacity for 84 passengers. We didn’t travel far but we did get the bus out on a deserted open road where we could practice maneuvering a vehicle of that size. One of my favorite features was the “Body Fluid Cleanup Kit” (see below picture) hanging above the windshield. I wonder if that’s ever been used? Branson took the wheel next. Believe it or not, the turning radius on this thing was actually pretty good! At one point Branson did have to three-point-turn in the middle of a road and I was amazed that he was able to do it. Obligatory bus + Legend shot. The bus was spray-painted by an employee of my brother’s company for the event they used it in. Big thumbs up for this fancy ride. The bus had 205,343 miles on it. I was impressed that it fired up on the first try! We did have to wait a little while for the air brakes to pump up. Finally, here I am settling into the driver’s seat, which is quite bouncy. 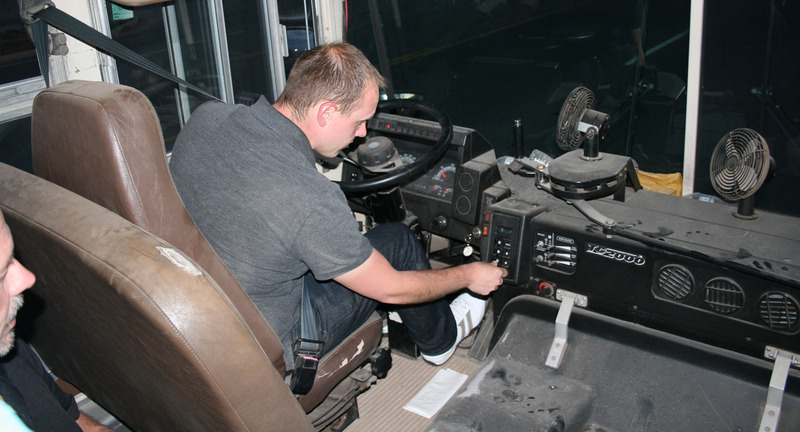 The seat itself has an independent suspension unlike every other seat on the bus. I enjoyed taking this gigantic ride for a spin. It was gutless but fun. Branson and I had Matt pick us up as if we were going to school – lights and everything! What a riot. Who wants a ride? I should borrow this thing for a cross-country tour and pick a few of you up. This entry was posted on March 31, 2013 at 10:44 pm and is filed under Car Show, Legend, Road Trip. You can follow any responses to this entry through the RSS 2.0 feed. You can leave a response, or trackback from your own site. WHOA! Branson Finished the Mustang!!! Great stuff! I LOVE these roadtrip posts. It makes us feel like we’re along for the ride. My favorites are the ones where you go investigating historic places and landmarks. Thanks for the great posts and all the time it must take to organize the pictures, stories, etc. 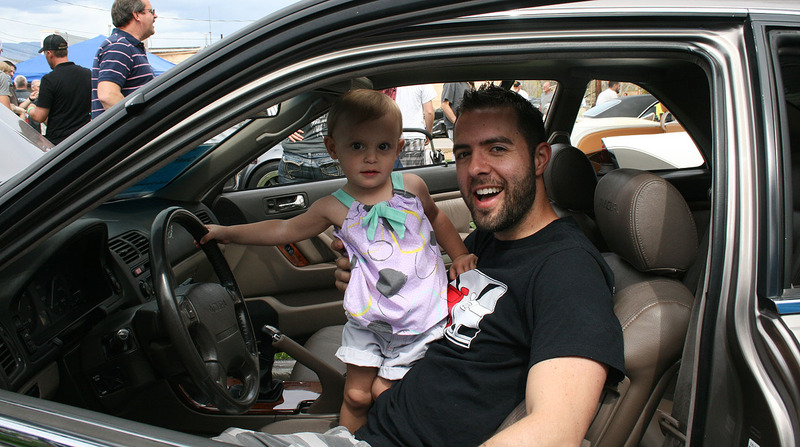 Tyson, awesome post and great car show pictures. Looks like it was lots of fun! Now I see why you got those hood struts replaced…to show off the Type-II. The bus looks like it would be fun too. Brings back memories of high school. Jason, you’re right – that’s why I did the hood strut replacement. Though the wind wasn’t particularly bad on Saturday, they call that small town “Hurricane” for a reason. I remember one year when my hood struts were bad, and the wind kept slamming the hood shut. I didn’t want any spectators to lose any fingers this year. Anyway, the bus ride was a blast. I’d like to try and drive one with a manual transmission sometime.